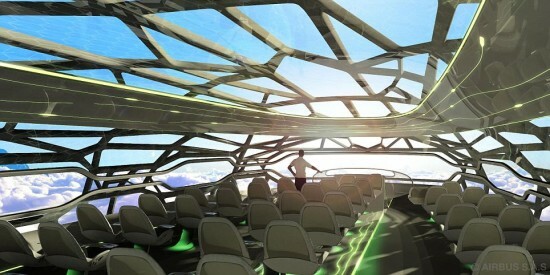 Last year, Airbus showed off their 2050 concept plane that would be efficient and environmentally friendly. Just in time for the Paris Airshow, Airbus has rolled out their vision for what the inside of that plane will be. In a mere four decades, air travelers can enjoy morphing seats, automated luggage handling, high-tech holographic amenities at your fingertips, acupressure seats, and oh, yeah, a see-through airplane skin. If the idea of hurtling through the sky in a transparent airplane doesn't unsettle you, read on.